When you find yourself experiencing pain, whether it be chronic or acute, there is one thing on your mind — feeling better fast. That being said, sometimes you might not be able to get an appointment with your preferred clinician or doctor for a couple days — but simply accepting the pain is not an option. Luckily, there are a few things that you can do to find quick relief from pain without having to leave your home. In today’s blog post, we will be discussing a few simple home remedies that can be used to manage pain..
One of the best ways to ensure that your chronic or acute pain is managed is to get an adequate amount of sleep. While it might seem like sleep can’t directly help with the mitigation of pain, getting proper amounts of sleep can help promote healing and manage the levels of pain that you are feeling. That being said, you don’t need ten hours of sleep to promote healing and pain management. Instead, simply eight hours will be sufficient — being that most people receive less than eight hours of sleep on average. Hydration is a key factor in managing chronic and acute pain. Some of the most common causes of pain are injuries or chronic conditions that affect the musculoskeletal system. When you are suffering from musculoskeletal pain and are dehydrated, movements can be hindered by tense muscles and ligaments that have become stiff as a result of lack of water. But how does water affect stiffness? Water helps your blood carry healing nutrients and oxygen throughout your body to the musculoskeletal structures that have become stiff. So staying hydrated can drastically reduce the pain that you experience on a day to day basis. When you feel aches and pains throughout your body the last thing that you think about doing is going to the gym or going on a run. After all, doesn’t that sound like the movement and jarring motion could cause more pain? While exercise might contribute to the general discomfort you are experiencing at first, endorphins will soon begin to course through your body — binding with the opioid receptors in your brain. When the endorphins bond with the opioid receptors, the sensation of pain will begin to subside. As we said above, one of the most common causes of chronic or acute pains is when there are irregularities in your musculoskeletal systems — more specifically the tenseness of muscles and ligaments. The tenseness in your muscles can arise from a chronic condition or a past injury, and one of the best ways to relieve pain is to apply heat in some way or another. Some of the more common ways that you can loosen muscles and ligaments using heat therapy are to apply heating pads to the affected areas, to apply a heating topical gel, or to soak in a warm tub — all of which will help to alleviate some of the pain that you are experiencing. Whether you suffer from chronic back pain (like millions of others worldwide) or if you suffer from a more rare musculoskeletal disorder, you could probably stand to benefit from stretching. Stretching can help to temporarily alleviate muscles and tendons that have become tight, and if done regularly, stretching can reduce your chance for muscle tightening in the future! Often times, if you are experiencing pain as a result of something other than a past injury or a musculoskeletal disorder, it is likely that you are experiencing some form of inflammation. Inflammation can be reduced in a number of ways, but of the most proven is to apply cold therapy like a cold pack or to take an over the counter anti-inflammatory medication or medication prescribed to you by your doctor. 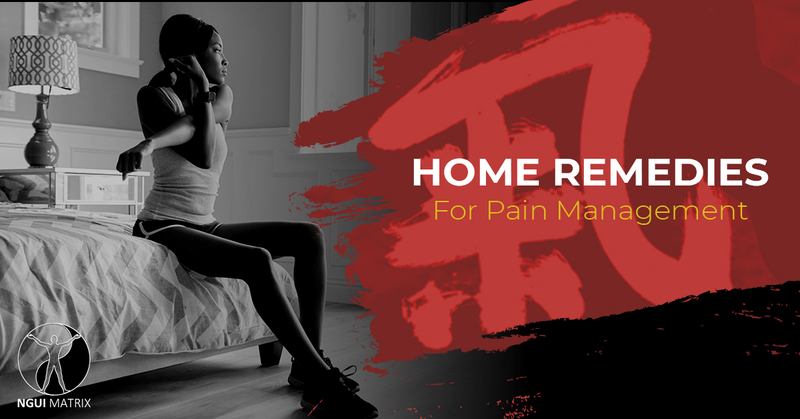 While today’s blog post is all about pain relief remedies and ways that you can perform in-home pain relief, it is extremely important to understand that home remedies for pain relief are not always a viable option. For some people, in-home pain relief remedies are simply not strong enough for their bodies to respond to, for others, their source of pain is more severe than they initially thought. Because of this, it is important to see a medical professional right away upon finding that your in-home pain relief remedies are not working. But what if you would still prefer a more natural method of pain relief? If you are experiencing pain and wish for it to be resolved — or at the least managed — by using a non-toxic and non-invasive treatment, we urge you to consider finding a clinician that is versed in the innovative new treatment regimen known as the NGUI-MATRIX. The NGUI-MATRIX, created by Grandmaster Stanley Ngui, is a new pain management strategy that utilizes concepts from both Eastern and Western medicine to holistically address the cause of the pain. If you are interested in learning more about the NGUI-MATRIX we urge you to visit our website, attend an upcoming medical conference, or book Grandmaster Stanley to speak at your next medical event. If you have any questions about the NGUI-MATRIX or how you might be able to learn this innovative pain management regimen, we urge you to contact us today.